A timely offering in commemoration of the 119th year of Philippine Independence, Go Lokal! hits Rustan’s Department Store in Makati, following the store's successful launches in other premier malls. Trade Secretary Ramon Lopez (center R) with Rustan’s SuperCenters President Donnie Tantoco (leftmost) recently (8 June) led the ceremonial launching of Go Lokal! at Rustan’s Department Store in Makati which will run until 9 July 2017. Serves as the fourth opening of the all-Filipino concept store that offers the best products from Philippine micro, small and medium enterprises (MSMEs), including the next generation One Town, One Product (OTOP) offerings, Go Lokal! is in line with the Trade Department’s initiative to empower MSMEs by providing market opportunities for them to be discovered in the mainstream market. Aside from providing market access to MSME products, Go Lokal! is a platform for new entrepreneurs to test the marketability of their products without fear of losing commercial costs because their experience is free of charge. 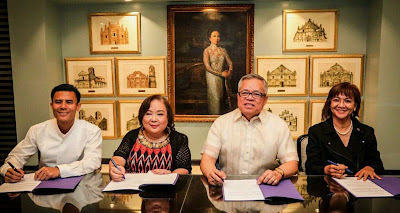 Also in the photo are Trade Undersecretary for Industry Promotions Group Nora Terrado (rightmost) and Rustan’s Commercial Corporation President Zenaida Tantoco (center L).